John Crow, saxophonist with local 1960s R&B band, J Crow Combo. 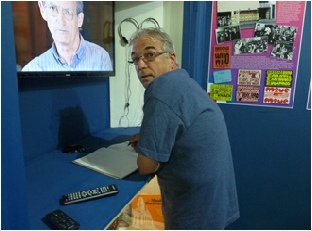 A few names from the past who have visited the exhibition. 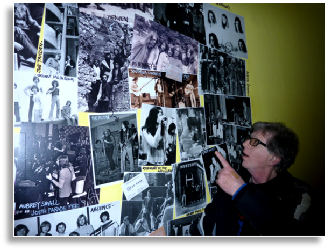 Bass player Mick Legg, ex-Rosemary, Tangerine Slyde and other Portsmouth bands, spots himself on the Wall of Fame. 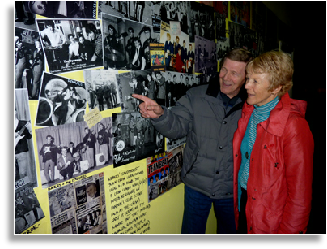 Barry Golding (Barry & the Strollers) finds himself on the wall, with him is his wife Doreen (Parsons) who ran the Indigo Vat in Hampshire Terrace in the 1960s. 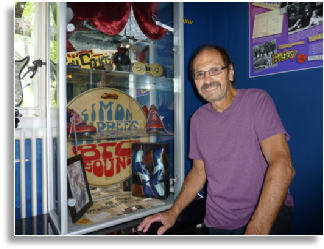 Tony Ransley, once drummer with Simon Dupree and the Big Sound, sees his old bass drum skin after many years. 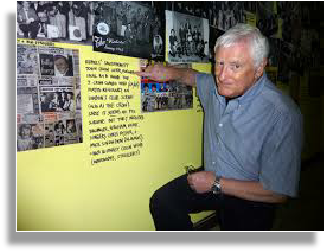 Alan Clarke, sound engineer for many venues and still works with Des O’Connor. 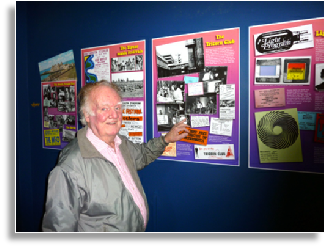 The first person to sign the visitors book was Roger Freeman, brother of Phil, one time roadie for Soul Society and a Guildhall stage technician, he now lives in the U.S.A.